Of late, shocked to their ultra-sensitive core, our chattering classes tug extra-hard on our national fire bells. With exhilarated alarm, they alert us to how unloved we are overseas. Our news purveyors appear to take uncommon pleasure in driving the point home. This monumentally significant poll was conducted on the eve of German President Joachim Gauck’s visit to our backwoods. We’re definitely on a treacherous downward spiral because, as several reporters stressed, “a similar Stern survey in 2009 found that only 49% considered Israel aggressive.” Ouch! Underscoring how we’re perceived by the descendants of active Nazis and of those who inactively couldn’t care less about their Germanic genocide, we were somberly informed that “70% of Germans agree with the statement that Israel pursues its interests without consideration for other nations.” Three years ago, just 59% of holier-than-thou Germans regarded us as an egocentric and thoughtless bunch. Things were so peachy then. It was with utter glee that our media seized upon the annual BBC poll geared to identify the countries with the most “negative influence” on the world. “Israel’s image hits another nadir in Europe,” gravely intoned our talking heads. According to 24,090 respondents worldwide, only Iran and Pakistan outranked Israel in perceived malice. Iran got top billing (55% of the vote), Pakistan was the runner-up (51%), while Israel and North Korea tied for the title of third-worst (50%). This sufficed to convince our memory-deficient correspondents that things were never as bad. Last year, they told us, a mere 47% claimed that we upset them most. Things indeed seem to be deteriorating ominously. Next on the hit-Israel hit parade came the American State Department’s castigation of our use of the term “illegal infiltrators” to describe the African illegal infiltrators who illegally infiltrate into our sovereign domain (where we and not the current Washington elite supposedly have the final say-so). Occasionally calling a spade a spade elicits warranted world disapproval, warned local opinion-molders with paralyzing panic. The never-put-a-foot-wrong Obama administration has just – again – frowned upon us for not living up to its expectations of absolute political correctness. Time to quake in our sandals. Is there indeed anything new in the fact that we’re cast as the villain of whatever drama plays out in the international arena at any given time? Right now we mar global contentment by constantly nagging about the Iranian “commitment to Israel’s destruction” (as Tehran’s military chief-of-staff recently declared without undue niceties, but failed thereby to cause noticeable unease among Western democracies). Nonetheless, even before the Iranian threat to obliterate us became potent and before we suggested that we might be forced to maybe help ourselves, we weren’t exactly popular among the smug spectator states. In 2007, the same BBC poll (then with 28,389 respondents in 27 countries) also revealed that we aren’t liked. But in contrast to third-place now, five years ago Israel topped the list of trouble-making countries and even beat Iran for the dubious distinction. That was when Ehud Olmert headed our government, and there has never been an Israeli PM as wrong-headedly generous with territorial and other existential concessions as he was. Yet Olmert’s inordinate, risk-fraught largesse was rewarded with heaps of scorn from the polled masses abroad. So much for leftist land-for-popularity slogans (akin to the land-for-peace farce). Even 2007 was nothing new. In 2003, the EU citizenry voted Israel “the greatest danger to world peace.” The same happened in 2000, when Ehud Barak headed Israel’s second-most compromising government ever. Right-wingers, left-wingers, patriots, defeatists – it makes no difference, not in this 21st century, nor in the 20th, 14th, 7th or in BCE days. The more things change, the more they stay the same. Jews always have and still attract abuse – even when they call themselves Israelis. From time immemorial they found themselves in the eye of whatever storm was brewing. They didn’t rouse the tempest, but it always menacingly revolved around them. From the dawn of history Jews were civilization’s codifiers of ethics and harbingers of progress. That’s enough in itself to render them unbearable irritants. Higher ideals accentuate others’ deficiencies. Jews robbed the world of its complacency and, as mankind’s killjoys, they became catalysts of controversy. When humanity was caught up in paganism’s fear, frenzy and frolic, we introduced the principled One-God. When others adopted offshoots of our monotheism, they accused us of deicide or of spurning Allah’s Prophet. Concomitantly, the secular lot – be they of the fascist or the professorial varieties – denigrate Jews as imposers of austerity, moralistic emasculators and corrupters of mythical natural bliss. Jews were the reviled plutocrats and the bourgeoisie in dictatorships of the proletariat, and the proletariat agitators to robber-barons and captains of capitalist industry. We were too ostentatiously rich or too bedraggled poor, too repulsively ugly or too exotically enticing, too obsequious or too arrogant, too downtrodden or too exploiting, too high on the moral ground or baking matzos with the blood of Christian tots (or Muslims, depending on libelous particulars). We were continuously too smart for our own good and therefore accused of cabals and hatching nefarious plots. We were the perfect target because we were weak, but decried as too strong when we strove not to be so helpless. Taking up our cause was always unfashionable. It still is. Arnold Toynbee’s exasperating “fossils,” we remain the irksome touchstone for whatever transcends the sordid and selfish. We are in their faces, be they Nordic or Malay – even when we belittle ourselves, borrow their inane ways, look like them, adopt their fads, dance to their rhythms and try to win their acceptance at any cost. Our existence constitutes a constant embarrassing reminder of their crimes. We were always guilty as charged. 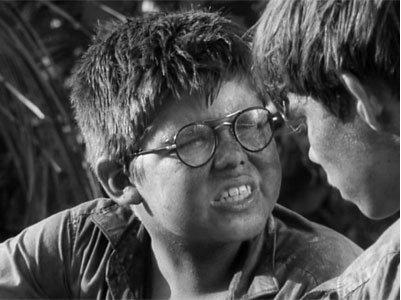 We Jews – in our independent Israeli present or in our Wandering Jew past – always endangered the peace of the world, much as pudgy, bespectacled Piggy did in William Golding’s philosophic and conceptual masterpiece, The Lord of the Flies. This allegoric novel probes the descent into primitive tribalism and savagery of plane-wrecked schoolboys on an uninhabited island. Eventually animal instincts vanquish the last vestiges of civilized reason and collective sanity. The worst offenders are the uniformed choirboys, seemingly the most cultured (like boastful German kulturtrager or academic Israel-bashers on campuses everywhere). Piggy’s ethics and responsible good sense plainly produce conflict. Without his bothersome input, all would happily share the same dark impulses and infectious brutality. Only Piggy spoils things, being obviously too far removed from humanity’s barbaric roots and always obsessing about rights and wrongs. Mankind, like Golding’s marooned kids, creates its own demons and then hysterically seeks to accord them a tangible identity it can berate and bully, hate and harm – like Piggy, or like Jews, a.k.a. Zionists, Israelis or whatnot. Like wisdom-dispensing Piggy, Jews are humanity’s intellectuals, offering it only enlightenment. Piggy’s glasses, through which he observes the world and makes sense of chaos, are also the source of fire and light. But while benefits from Piggy are grabbed, he himself is shunned. His higher ideals accentuate the others’ misbehavior. Depriving them of their peace, he becomes the driving force of discord. Like us. Our detractors always remember that we’re Piggy, never one of the boys. They’ll always side with our attackers and blame us for it. It’s time we stop blaming ourselves too, trying to make sense of their antipathy, winning them over and convincing them that we’re regular folks. It’s time to stop trying to make them like us, secure their approval and good press or care about their opinion of us. Smearing Jews inevitably justifies enmity towards them. They bring it on themselves. They always did. Europeans who decades ago shouted “Jews to Palestine,” and showed no mercy to those who couldn’t flee in time, now shout “Jews out of Palestine.” With Jews unwanted anywhere, the bottom line precludes any Jewish survival. Killing Jews was never like killing others. Since Israel is foremost in Ahmadinejad’s sights, there’s no urgency for even nonviolent measures like persistent no-nonsense sanctions against his nuclear ambitions. If only Jews are nuked, the rest of the world can tolerate Iran’s bomb. A Jewish-only target is almost a plausible compromise. It’s not about issues or our misdeeds. It’s time for in-house popularity-seekers to quit trying to curry favor by joining the anti-Piggy clamor and snitching about the generic Piggy’s trumped-up transgressions, his outlaw settlements and defiant self-defense. Nothing good can come of additionally tarnishing his already unjustifiably battered image. It’s time for this world’s nonfictional Piggy to overcome his awe of remorseless choirboys who presume to pass judgment on him. If we’re to preempt the bloody end of the fictional Piggy, we must overcome our awe of remorseless Judeophobes – genteel or otherwise – who presume to pass judgment on us. Our lives depend on it. No less. Take some comfort, because if there is another attempt to do some serious genocidal harm to the Jews, we’re going to be taking a lot of those little bastards with us. Now there, don’t you feel better already?? Noodles, I cannot speak for Sarah, but I ***LOVE*** your statement ! It’s not dear Sarah B. Chris, but better than a kick in the behind, I guess. Alas, accomplishing all of this with only .00333% of the world’s population. That’s 333 jews out of every 100,000 people on the planet and only 84 Israelis out of every 100,000 people on the planet. What an influence!!! “largesse was rewarded with heaps of scorn” – The world despises weakness but respects strength. In time, the strong are even loved. Israel’s media, as always, is busily, 24/7, obfuscating the truth. Most people belive what they are told. That’s why we are where we are. The US State Department castigated our use of the term “illegal infiltrators”. Well, I’ll be…Such a statement from a country who coined that term, and should know better is at least surprising. I have this comment for all those pure of hearts, especially in the E.U. What if Israel had a fearless leader with a steel spine who didn’t give a flip what the pagan perverts of the nations said or thought about Israel and cared more about what God says and thinks ? What if the traitorous grasshoppers of Israel who fear and serve evil man and not God were targeted for abuse instead of ‘settler’ Jews ? What if the IDF has crossed the Litani River in 2006 and finished off Hezbollah permanently instead of bowing in reverential obedience to the pagan skull and bones treacherous backstabber President Bush ? What if the IDF had stayed in Gaza until Hamas was obliterated,would it be possible for the hypocrite nations to hate Israel more ? I SAY ;Sharpen your teeth Ariel and give the evil nations something to hate about you because weak appeasing,groveling kapo leaders who do the dirty work for Israel’s enemies by driving fellow Jews off their land and destroying their homes is a lose lose game. In the real version of the text, who would the “Babylon” be referring to in today’s modern world? Seriously ,you have to ask ? Who is presently the biggest meddling bully,superpower empire which afflicts Israel with it’s devious peace farce and arms it enemies with the latest,high tech weaponry ? Who has brought the mess to Libya,Egypt,Iraq,Afghanistan under their rather expensive war’s of farce and who came to the rescue of Hezbollah and Hamas and keeps the always drowning prone Palestinians afloat with large sums of cash while always restraining Israel from finishing off her enemies ? no I am not that stupid or naive that I need to ask (rather toungue-in-cheek, I might add). I’d just like to see someone say it out loud. The Stern poll showed, that 70% of Germans proved to be Hitlers children…and I am dead SERIOUS about that ! Mr. Gauck, you are pretending to be Israels friend, so please stop to meddle into Israels affaires, STOP to promote the “two states” solution ! You once wanted the one state solution to come through for Germany…so stop trying to force on Israel, what you once rejected for Germany ! STOP your most ARROGANT meddling into the affaires of the Jewish state…Israel does not need A N Y German giving his ***unwanted*** advice ! Sarah, I don’t want to hijack your blog, but time is of the essence and so, if you would allow it, I would very much want to alert everyone, to come to the support of Migron ! Excellent article! I knew Beelzebub as the Lord of the Flies already, and now I will always think of the unpronounceable Iranian as one of his chief understudies. And in spite of the Prince of Persia being a very bad fallen angel over the Moslem world, I believe Michael is still looking out for little old Israel rather nicely. But while the spirit world is slugging it out wherever they do such things, Israel has to take on the physical bad guys from time to time, which is scary and serious business. People of true God-consciousness will always support Israel in these moments and fervently pray for the peace of Jerusalem. Israel has a destiny- a great one! Europeans care a bit more than they did in 1349? Possibly; some of the more practical among them might. But don’t expect it. Only a short note about Bonhöffer…in fact he WAS a Christian Antisemite ! That he died at the hand of the Nazis cannot reverse that stain ! And keep in mind, that the source of all the other SYMPTOMS of Jew hatred…like the plague story, is the alleged DEICIDE which is written into the “New Testament”…and it stands until today…! Yes, Boenhoffer believed that Christianity had superseded Judaism as the new chosen people of God. Does this make him an anti-Semite? I don’t think so. After all that religious belief hadn’t stopped him from actively resisting the Nazism and aiding Jewish refugees fleeing. Eventually his efforts led to his arrest and hanging in the final days of war. This man paid an ultimate price trying to save Jews. We can disagree with Boenhoffer on theological level while at the same time acknowledging the fact that the man was a righteous gentile and a hero. No, you’re wrong…Bonhoeffer wasn’t an anti-semite; and Hitler didn’t “grow up like Bonhoeffer.” Hitler was the neer-do-well son of a minor Austrian school official, Alois Schicklgruber; Hitler was pagan; he wasn’t a church-goer, and had no religious scruples. Now…if you were referring to Martin Luther….then yes, you would be correct. Many years ago I did research on Bene Moshe because of a postcard sent by Metman-Cohen to Yehoshua Barzilai. A philatelist friend of mine asked me to translate the postcard. I told him that all the names mentioned there were streets in Tel Aviv. I did research on the various names and discovered that they were all members of Bene Moshe, founded by Barzilai (not Ahad Ha’am). I visited the Metman-Cohen graves in Trumpledor cemetery. I was very sad when Gymnasia Herzliyya was torn down. My school, Herzliah Teachers Institute in New York, was named for it. As usual, brilliant, insightful, and true. Just returned from visiting family in Haifa. Also in Jerusalem and Tel Aviv. My view is that Israel and Israelis are doing just fine. The Europeans still hate us. After all, look at how well they’re doing right now. I have often thought that the Nazi repudiation of Christianity because of Christianity’s strong Jewish roots contained an underlying message not often directly expressed even by the Nazis themselves: namely a resentment of Judaism because of the Jewish morality and ethics imposed on the former pagans of Europe via Christianity, a morality and ethics which many of these Christians actually despise or find overbearing, although they will never admit it. In my experience most true Christians, i.e. those who try to live by Christian ethics and principles expressed in the Gospels, and who do not just simply go through Christian rituals or espouse Christian doctrines to make themselves feel good, are rarely anti-semitic and in fact often are friends of the Jewish people, because they recognize how much Christianity is indebted to Judaism and that Christ himself remained a committed Jew throughout his life. These Christians are comfortable and are grateful for the moral teachings of Christianity inherited from Judaism. Unfortunately, the bulk of the Christians do not fall into this group, but belong to the other group who preach or pretend to adhere to Christian morality but never actually practice what they preach, either by intention or through their own ignorance. This dichotomy between thought and action distresses their souls, and in an effort to relieve this discord what better place to shift the blame for their inner turmoil than the source of the very morality that is responsible for their inner turmoil, namely Judaism? I was hoping they would leave you in Caroline Glick’s spot in the JPost. It’s not that I dislike Glick, but she lacks the historical depth that you routinely bring to your writings.